"Dinosaurs at Dusk" promotional poster. 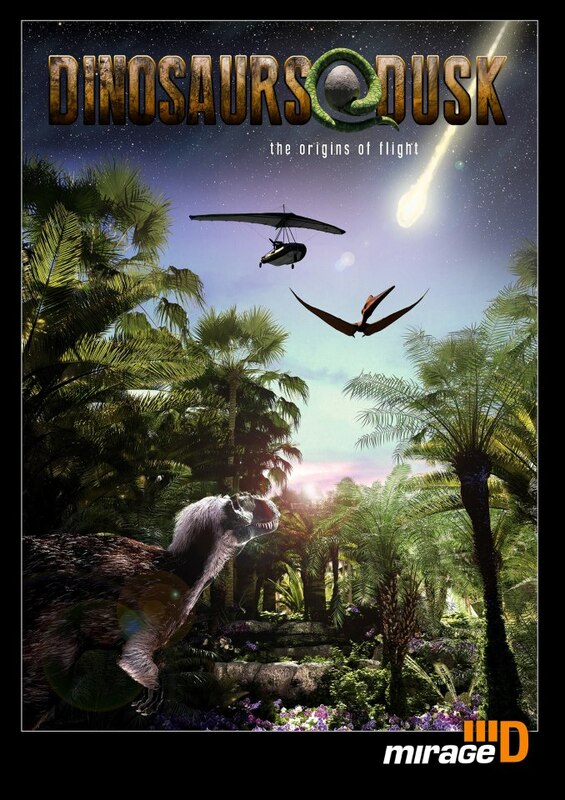 "A Planet for Goldilocks" -- Tuesday through Sunday at 2 p.m.
"Dinosaurs at Dusk" -- Tuesday through Sunday at 3 p.m.; Thursdays only at 7 p.m.
"Dinosaurs at Dusk," produced by Mirage3D, takes audiences back in time to explore the origins of flight. 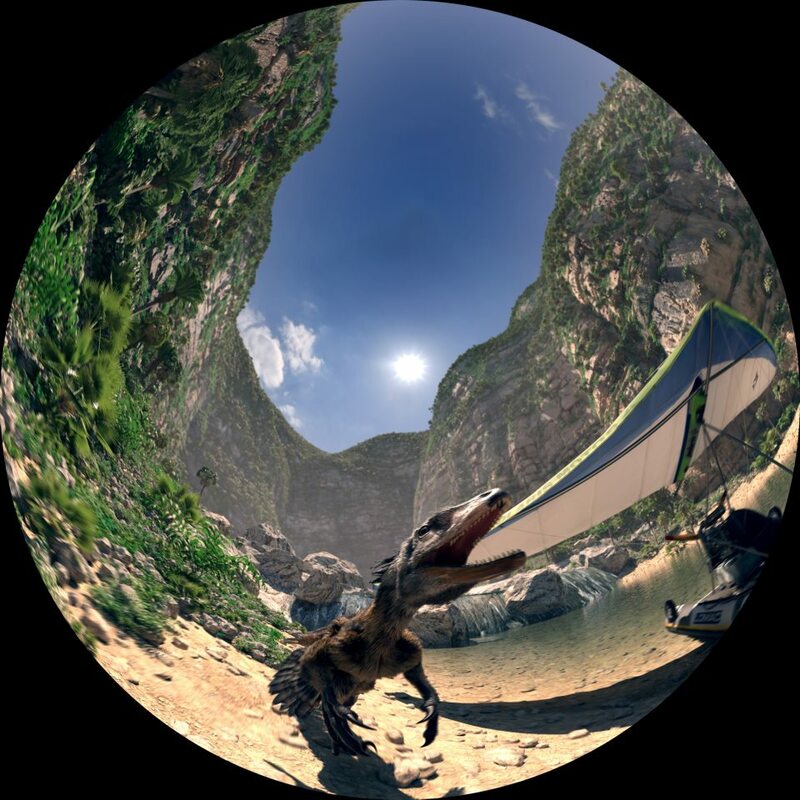 Audiences will meet the remarkable flying reptiles called pterosaurs and wonder at amazing dinosaurs that had feathers. They will take flight and discover the implications of continental drift, asteroids and impacts, and the convergent evolution of flight among species. Finally, they will experience first-hand the cataclysmic "last day" of the dinosaurs. Total running time is 44 minutes. "Audiences will have a really incredible immersive experience with the dinosaurs," planetarium coordinator Jack Dunn said. "We are one of the first planetariums in the U.S. to present this award-winning program." The other show on the summer fulldome schedule, "A Planet for Goldilocks," explores the search for a planet like Earth -- one with temperatures, oceans and an atmosphere suitable for life. The quest is a little like Goldilocks' search for a decent bowl of porridge: some are too hot, some are too cold, but some are "just right." Following this show, there will be updates on the current night sky. Total running time is 42 minutes. The schedule subject to change. For the more information about fulldome shows, astronomy and space science, visit the planetarium's website, http://www.spacelaser.com, or phone 402-472-2641. The University of Nebraska State Museum of Natural History in Morrill Hall and Mueller Planetarium are south of 14th and Vine streets on the University of Nebraska-Lincoln City Campus. Parking is free in front of the museum. Planetarium tickets include museum admission and can be purchased at the museum's front desk the day of the show. Admission is $9 for adults (19 and older), $5.50 for children, and $3 for UNL staff, faculty and students with valid NU ID. For more information on the museum, visit http://www.museum.unl.edu.